Not everyone would call these rich chocolate desserts cupcakes. 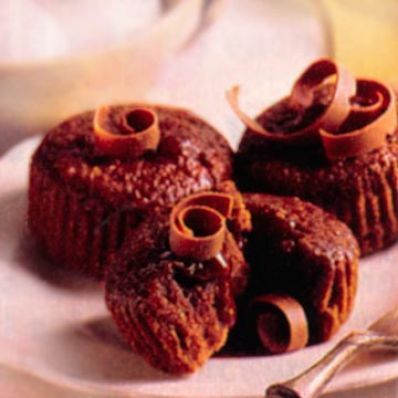 But they're baked in cupcake liners, and the milk chocolate is so luscious that you won't care what they're called. 1 of 4 Heat oven to 325 degrees F. Line a standard-size 12-cup muffin pan with paper liners. 2 of 4 Melt chocolate in top of double boiler over simmering water. 3 of 4 Stir eggs and flour into melted chocolate with wire whisk or wooden spoon. Ladle into prepared muffin-pan cups, dividing equally. 4 of 4 Bake in 325 degree F oven for about 12 minutes or until sides of cupcakes are set but centers are still liquid. Cool cupcakes in pan for 5 to 10 minutes. Centers will set into warm mousse. Garnish with chocolate curls, if desired. Peel off the cupcake papers carefully.